Resource center Rehab Options for Crystal Meth How Long Does Crystal Meth Withdrawal Last? Crystal meth is a particular form of the drug methamphetamine (“meth” for short) named for its appearance. The production methods of this substance cause the end product to look like small crystals or shards of glass. These are often heated up to be smoked or dissolved into a solution to be injected directly into one’s veins. According to data from the 2012 National Survey on Drug Use and Health (NSDUH), over 12 million Americans have used methamphetamine at least once in their lifetimes. The problem with drug binges is that they tend to increase the rate at which users build a tolerance to the substance. Tolerance occurs when a substance is present in the body enough that the brain begins to adjust to it, making changes to try and bring things back to normal. Users then need higher and higher doses of the drug to achieve the same effects. When intake of the drug stops, these individuals then experience withdrawal. Withdrawal symptoms from meth can be very intense. Though not typically dangerous, the unpleasant effects combined with cravings can create severe temptation to relapse shortly after an attempt to quit begins. Without professional medical help, many people will relapse in the first day or two of withdrawal. In severe cases, psychosis can cause a person enduring withdrawal to completely lose touch with reality. This can cause panic, or if mixed with aggression, it can cause the individual to lash out physically. Otherwise, the most dangerous symptoms are depression and anhedonia. Because people addicted to meth spend days, weeks, months, or even years awash in artificially stimulated pleasure chemicals, once the drug is no longer in the system, the pleasure center of the brain is left in a severely impaired state. This inability to feel any kind of pleasure can lead to suicidal urges, especially if it’s prolonged. Luckily, withdrawal symptoms from meth typically only last around 7-10 days. Still, for someone enduring these effects, 10 days can feel like an eternity. Many people report doing nothing but eating and sleeping for the first couple days due to the fact that meth suppresses both appetite and the desire for sleep, sometimes keeping people up for days at a time. Excessive eating and sleeping during withdrawal are necessary and help the body get back to its normal state. Energy levels tend to build back up during the next few days. In severe cases, emotional symptoms, particularly anhedonia, can last for weeks and may requiretreatment with antidepressants for a time. 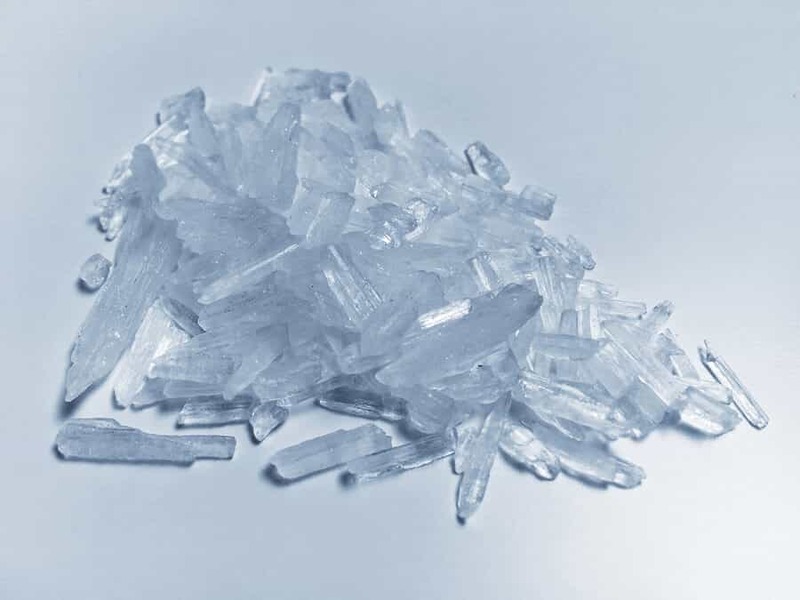 Meth, sometimes called crystal meth or ice, is a potent synthetic stimulant chemically similar to amphetamines. Typically, it is a white, odorless powder, but in the specific crystal meth form, it looks like shards of crystal or glass; the drug can be chunks of white, clear, or blue. Crystal meth is most commonly manufactured in Mexico in “super labs,” then transported to the US; meth labs have decreased in the US since 2010. This could be due, in part, to laws that greatly restrict the amount of ephedrine or pseudoephedrine cough and flu medicines a person can buy. Ephedrine and pseudoephedrine are ingredients commonly used in the manufacture of crystal meth. This drug is dangerous and causes serious physical and mental harm to people who use it regularly. It is possible to overcome an addiction to crystal meth, but doing so generally requires medical supervision and help through a professional rehabilitation program. Below are some frequently asked questions about ending an addiction to crystal meth. Are there detox medications to treat meth withdrawal symptoms? Physical symptoms of withdrawal from crystal meth tend to be exhaustion and hunger, as meth makes the individual feel like they do not need sleep and suppresses appetite. The more serious withdrawal effects from meth tend to be psychological, including mood swings, depression, anhedonia, and intense cravings. Bupropion, the generic name for antidepressant Wellbutrin, has shown to be effective in helping people manage cravings. Modafinil, a mild stimulant, may help people going through the first week of meth withdrawal manage daytime sleepiness. This in turn could make them feel less depressed. Fluoxetine, the generic name for Prozac, seems to help people withdrawing from many stimulant drugs, including meth and cocaine. The medication appears to moderate depression and physical pain or aches related to withdrawal. Mirtazapine, the generic form of antidepressant Remeron, has also been found to help control cravings and depression in people who were withdrawing from meth, and it was shown to help with abstinence maintenance in a 12-week trial. While none of these drugs have been specifically approved to treat withdrawal symptoms from crystal meth, they may be useful, depending on the individual. What is the safest way to detox from meth? Medical supervision and a comprehensive rehabilitation program following withdrawal are the best ways to detox from crystal meth and overcome the addiction. People who get help to overcome their abuse of crystal meth are twice as likely to maintain abstinence, compared to people who do not get medical attention and social support. How much does a meth detox program cost? The cost of detoxing from crystal meth depends on the type of program a person enters. Inpatient rehabilitation programs and outpatient programs have different costs; due to the costs of room, board, and 24-hour supervision, inpatient detox is more expensive. Hospitalization for serious symptoms may add to the cost, or it could be covered by insurance. The Substance Abuse and Mental Health Services Administration (SAMHSA) has a treatment locator to help people who need help, or their loved ones, find appropriate treatment options. It can also be helpful to start with one’s insurance provider to ensure that treatment is at least partially covered. How can you avoid relapsing after detox from meth? One statistic suggests that 88 percent of people recovering from crystal meth addiction are likely to relapse in the first three years after they detox from the drug. However, the good news is that people who seek help in a rehabilitation program are twice as likely to succeed and maintain abstinence. The best way to avoid relapse is to enter a professional rehabilitation program, commit to ongoing group and individual therapy, take medications as prescribed, and get social support from loved ones and peers. Relapse is often part of the disease of addiction. Relapse does not mean complete failure; it is just a symptom of the disease. When a person relapses, re-entering a rehabilitation program, returning to more regular therapy, and reaching out to loved ones for support can help the individual regain their commitment to sobriety and refocus on their health and wellbeing.